If you're in the L.A. area next weekend, check out the annual West Hollywood Book Fair. Takes place on Sunday, September 26 all day. Lots of great authors and informative workshops and panels. And of course afterwards, you can always slip into The Abbey or another place close by for a post-bookfair cocktail. Sundays are always fun in West Hollywood. If you're in the L.A. area in early October, you might want to check out Step Afrika! on Thursday, October 7 at 7:30 pm at the Luckman Fine Arts Complex on the Cal State L.A. campus. Step Afrika! is the only professional dance company in the world dedicated to the tradition of stepping. The group has performed before tens of thousands of people worldwide. 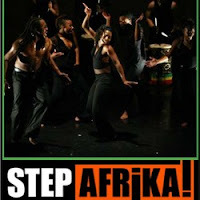 Check out this Step Afrika! promo clip from YouTube. This should be an evening of dance and performance like no other, as Step Afrika! traces the history of stepping from the gumboot dance tradition in South Africa to its current use by African American fraternities and sororities. Ticketmaster: $15 - $21. Luckman Fine Arts ticket window, with CSULA student, staff, faculty ID: $5. Contact the Luckman at (323) 343-6600 for more information. 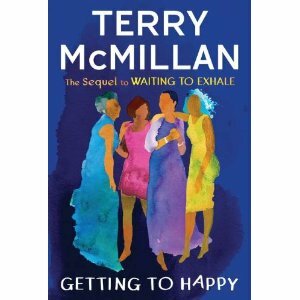 So today is the release date of Terry McMillan's new novel, Getting to Happy. It's the sequel to Waiting to Exhale, and finds us fifteen years later visiting the four characters -- Gloria, Bernardine, Savannah, and Robin. A little late for me to hit the bookstore. Didn't pre-order online. So I'll be making a special trip to the mall or Esowon tomorrow or late in the week. But I'm happy the new novel is here. Can't wait to read. I remember reading Waiting to Exhale in the early 90s, barely in college. Laughing out loud at the crack-up funny writing and stories the characters were telling, and my dorm mates asking what was I reading that was so fun(ny). I attended a preview reading Terry McMillan did at the LA Times Book Festival this year, and based on what I heard we're in for another crack-up funny and dramatic story. Can't wait to get Getting to Happy. You? I'm currently reading The Help by Kathryn Stockett. I was skeptical at first, but find myself enjoying the novel. It's the fictional story of a group of black maids who work for white women in Jackson, Mississippi in the 1960s. But, of course, this story was true for thousands of black women who had no choice but to work for white women in the U.S. Probably still is true. Sad, but true. Although skeptical about reading the book, I find myself thinking about my grandmother, who herself worked as help for a white family and raised their kids. Many of the details of the maids' lives (how they had to budget, keeping a garden in order to eat, the internal struggle of raising someone else's kids while feeling like they're neglecting their own kids) seem authentic in the novel so far. My skepticism, however, came from a white woman author writing a black woman's story. Wondering if any of you have read it or are reading it? Your thoughts? What about looking through a lens of social justice, equality, or being culturally empowered? Would this book be as accepted or "acclaimed" if written by a black woman author? Is this another "let us tell you about your experience" story? These are the questions I'm wrestling with as I read... and wondering if any of you can help with The Help?